Color in a garden imparts a sense of coolness or warmth. Color can also make us feel like we are looking at a serene landscape we want to sit in or, depending on what colors, it can get us moving along. The triple digit temperatures of the South Texas summers beg for some cooling relief in our landscapes. With the right plants, we can make our gardens far more comfortable by adding the cool or neutral colors. When mixed together in a landscape, the colors red, orange and bright yellow, give the signal to hurry along. They heat things up. It is hard to sit still in such a landscape, making a quite moment of reflection impossible in such a “hot” space. On the color wheel, green, blue and violet (or lavender) are considered cool colors. White and light cream are considered neutral. The cool colors impart a calming effect and, when mixed with a neutral color, they allow us to feel that we are in a cool, serene space. Green and white offer the coolest of landscapes and adding lots of white flowering plants or green or white foliage plants can help cool down some “hot” spots. In a shady garden, during the summer, we can use annual plants like white Impatiens (along with pale pink impatiens), and white and green Coleus to tone down areas. Gingers and the white or pink form of our native Turk’s Cap work well in areas that are only partially shaded, as do the Butterfly Iris (Dietes bicolor). In partially shaded areas, white vinca, Native Pigeonberry, the native White Plumbago and the white Cape Plumbago (Plumbago auriculate), and the native Taperleaf Heliotrope also work well. Full sun offers lots of choices, including white or cream oleander, native white mistflower, white hibiscus, the native Michele’s lantana, white cenizo (also called Texas sage) and several variety of jasmines are all shrubs that work in South Texas, as well as white flowering roses. Some natives, like Texas frogfruit and blackfoot daisy provide abundant flowers, at the groundcover level. 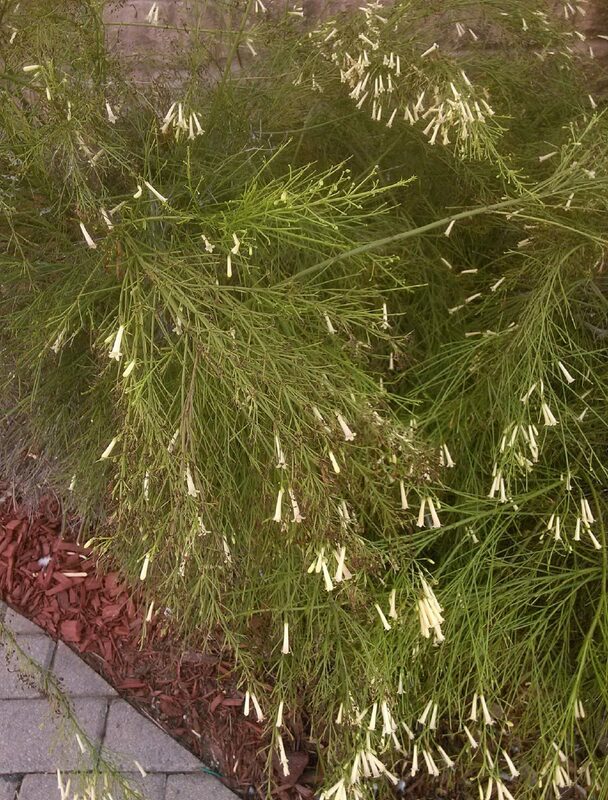 Additionally, there are sun loving coleuses in light colored foliage and there are white forms of both zinna and marigold (burpee seed), along with a white form (actually cream) of the firecracker fern (Russelia equisetiformis) that work well under windows or where you need something no more than 2 feet tall. Our native wild olive is an excellent choice for trees, providing a cooling effect in the garden, and it blooms most of the year. These are a few choices for cooling the garden with white flowering plants. Don’t forget you can also use the pale pinks, blues and violet colored flowering plants as well. For suggestions on butterfly plants, visit the Growing Growers Farmers Market today and speak with Toni or Benito Treviño about the many possibilities. This market is open from 9 a.m. to noon today in Firemen’s Park on the corner of 1st Street and Business 83 in McAllen.